This is the site of the first hill station in Malaysia built by the British during colonial times and was used by the wealthy British colonial elite as a place to escape from the heat of the lowlands, with many building bungalows on top of the hill to use as second homes. At 823 metres above sea level, the climate up here is a few degrees cooler and it is a pleasant place to visit and walk around the hilltop, which offers fine views over the city of George Town. As far as attractions go, there is not that much to see on top of the hill. What you come here for is the fine views, the slightly cooler climate and nature walks through the forest that covers the hillsides. Unfortunately, the top of the hill can be covered in a ring of cloud spoiling your views. This is true, especially in the mornings. However, often the clouds will rise as the day heats up. - so have a look over from Georgetown before setting off to see what the weather looks like on the top. If it's only cloudy on top and clear elsewhere, chances are the cloud will clear later on in the morning! Walking around on top of the hill is not too strenuous as it is fairly flat, but once you leave the top, it becomes quite steep in places. Buildings of interest are a small Hindu Temple as well as a Mosque, the Governor's residence. there are also many old English style bungalows and the only place to stay on top of the hill, The Bellevue Hotel. You have two choices - the easy but expensive for tourists way. Or the hard but totally free way. 1) You can catch the funicular railway train from Air Itam. 2) If you are fit enough, you can walk up from the Botanical Gardens in a couple of hours or so. 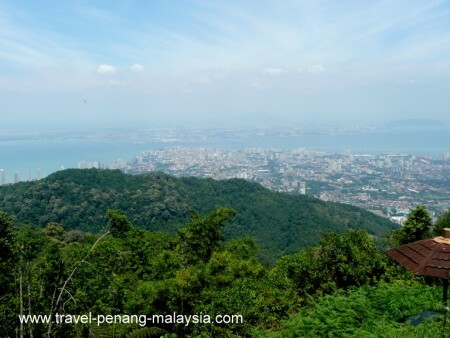 For more information about hiking to the top, please visit our Walking Up Penang Hill page and our Hill Map page.